Through the state budget, we identify, prioritize, and invest in the public structures and services we all rely on for our safety, prosperity, and stability. Unfortunately, Montana faces serious budget challenges that threaten our ability to maintain public priorities. 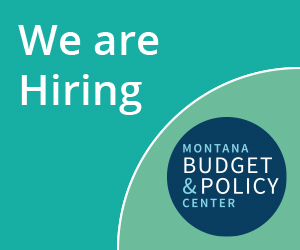 MBPC works to make budget issues — and the budget process itself — more accessible and easier to understand, to broaden participation in the debate and foster policies that work for all Montanans. A healthy state budget relies on fair and adequate taxes so we can make investments that create opportunities for all Montanans, including our most vulnerable neighbors. This State-Tribal Budget Handbook serves as an overview of how the state budgeting process works and how American Indians can get involved. Montana Budget Update Where Do We Go from Here?